So yesterday, whilst we were out photographing some new designs (more tomorrow) I took some of my own photos of this gorgeous jacket ready for when rights revert to me in six months. The hoodie uses Jamie Possum Plus 4 ply yarn in claret and amazingly only uses 10 50gm balls for the first size. 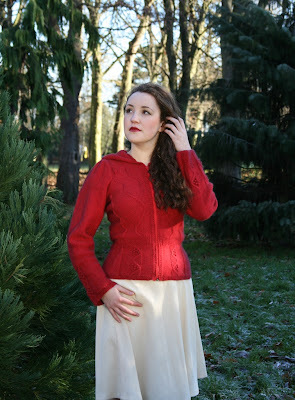 It is knitted in one piece from the bottom up with intricate but fun to knit bobbles on the pelmet, which also has shaping panels front and back leading to a ribbed waistband, emphasising and minimising the waist line. From here wandering cables travelling up the body, drawing the eye inwards creating a slim line silhouette. The pelmet detail is repeated on the bell shape sleeves which also feature attractive puff sleeves. 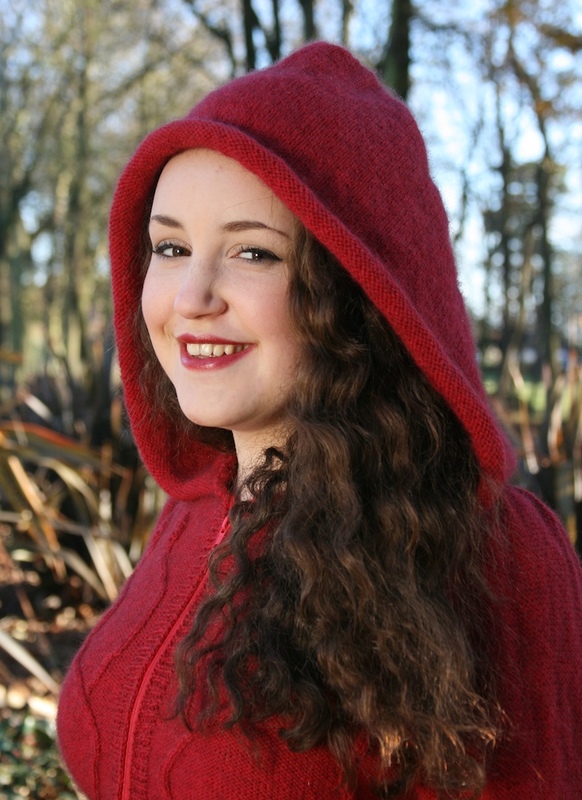 The hood is shaped as a traditional opera cloak hood, falling and resting on the shoulders. It is knitted in stocking stitch sideways, to allow the stocking stitch to roll back from the face, providing an elegant frame. My beautiful new model is a friend of my daughter's, and amazingly, this is the first time she has ever modelled. She was a delight to work with and, as with each model I photograph, she brought a different dimension to the clothing, which I really enjoy discovering. There's a definite romantic quality to these images, quite different I feel to other photographs I've taken. More beautiful photos tomorrow. Oh something I always forget to do! 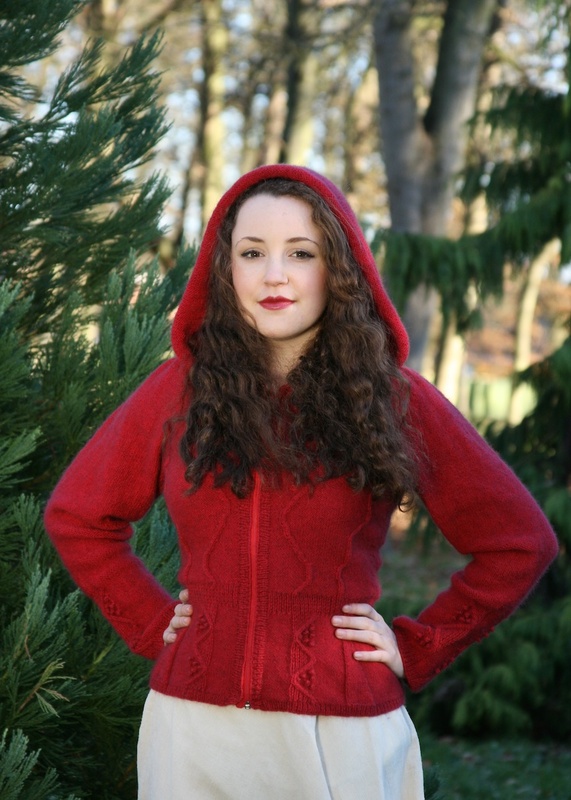 If you are a member of ravelry, you can favorite or queue the hoodie here. Thanks to everyone who posted here, on the knitonthenet group, and on my ravelry forums, in response to my Crochet Conumdrum. Every single person who has posted has stated that they would prefer two separate books - A Stitch in Time 2 devoted to knitting patterns, and the Mystery Titled book devoted to crochet patterns of the same period. So I think the decision, except for a title for the crochet book, is made. A Stitch in Time Vol 2 will be knitting patterns only (although there maybe crochet finishing techniques here and there!). The feedback everyone has provided has been fantastic. Thank you again for your help, it has really helped me make the decision. The second decision I have made, is that after much persuasion I have decided to take a stand at this year's Clothes Show Live at the NEC in Birmingham. It runs from 3rd to the 8th of December (6 days!) 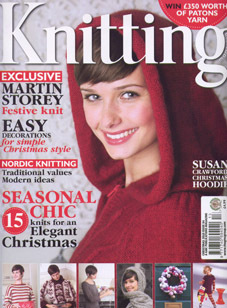 and I have a stand in the Sknitch area which is focused on knitting, sewing and craft. My stand will have as many garments from A Stitch in Time 1 & 2 and Vintage Gifts to Knit as possible along with other designs I've done for magazines and knitonthenet. 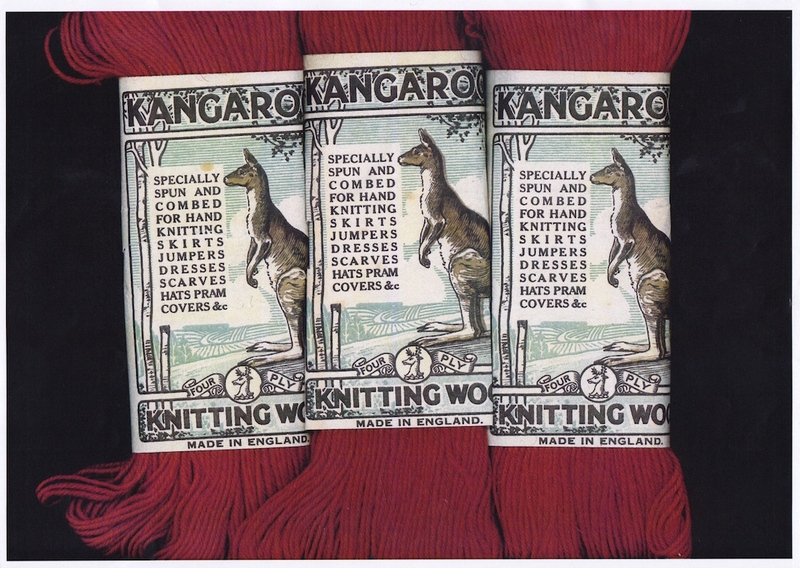 After the initial success of the Vintage Kits that I put together for Alexandra Palace I will also be formally launching the Vintage Knitting Kits collection at the show. 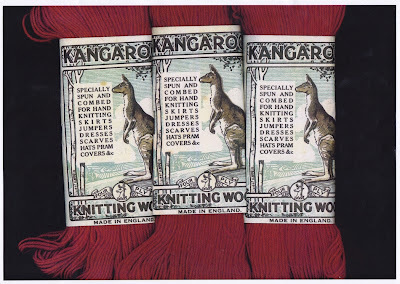 What I find really daunting is that for the first time this show is just about my work, and as such the stand is going under the name of Susan Crawford Vintage Knitting. Those of you who know me well, know that promoting myself is not something that comes easy, and I have always preferred to go under the banner of knitonthenet, Arbour House Publishing, A Stitch in Time or even Just Call me Ruby. They are all designed to provide me with something to hide behind. So this is a big step, but exciting. Confidence has never come easily for me, but I am hoping that I finally feel ready for this, to put myself out there. Its all very exciting, scary, enormous and serious. I even need to prepare a press pack. If you are visiting the Clothes Show, do come and find us in the Sknitch area on stand SK23 - Susan Crawford Vintage Knitting. On a much more relaxed note, I will be visiting Baa Ram Ewe in leeds for an evening of Vintage Christmas loveliness with mulled wine, mince pies and knitting. What could actually be better than that I ask you? If you live in the Leeds area do come and see us and have a thoroughly delightful Vintage Christmas Evening. Some of you may already have read on ravelry or the knitonthenet blog that I have a bit of a conundrum and I am hoping you can help me make a decision with Stitch in Time 2. I currently have too many projects than are allowed for the number of pages for the book (already bigger than SIT 1) and am having to make some big decisions. 1) Too many crochet to knitting patterns for knitters to be happy. 2) Not enough crochet patterns to justify it being classed as a knitting and ‘crochet’ book. Remove the crochet patterns from Volume 2 giving me the right project and page count and put together a separate volume of the crochet patterns, which also gives me the room to add some beauties which I just can’t include in the main volume. This book would obviously be available as a separate purchase but we are looking to have it ready at more or less the same time as Volume 2 and include a special offer price for buying both together. (It would be a smaller volume so also cheaper). I feel this then gives crochet the respect it deserves rather than as a foot note to the knitting patterns, and gives all purchasers knitters and crocheters exactly what they expect from whichever book they purchase. Would you buy a book on vintage crochet pattern 1930-1959 in the same format as Stitch in Time or would you just stick to the knitting book? Thank you so much for your help in this matter. Its a huge decision to make in many ways, and I really want to make sure I make the right choice. 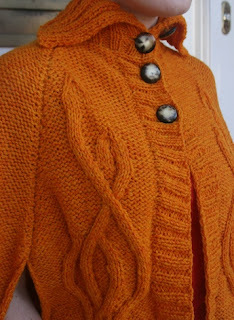 As you probably all know, I am a big fan of Shetland wools and I have a new design published in December's issue of Knitting (by GMC) using Jamieson & Smith Shetland Aran in a vibrant shade of orange. This is how she looks in the magazine. 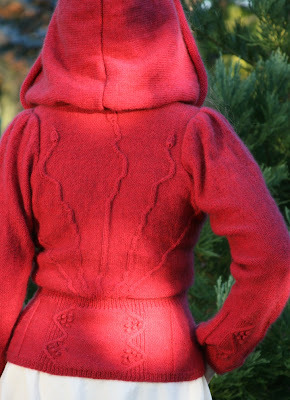 The wool is easy to work with and seemed to enjoy being worked into the twisting cables of the design. The original inspiration was victorian and edwardian evening cloaks made of devore velvet where abstract patterns have been burnt out of the lush, rich velvet pile. The theme suggested by the magazine in fact, was theatrical, and is a theme that given enough time, I would love to do a whole book of designs for! The collar is knitted to stand high, framing the face and to keep the neck warm - maybe when waiting for the handsom cab after seeing The Importance of Being Ernest or the like? I contemporized the style slightly with an interesting cable edging which is worked around the bottom of the cape once the panels have been sewn together. The cape itself is made up of five panels with cable patterns to the fronts and back panels, with the side panels in reverse stocking stitch. The ornate buttons I used are actually 1930s buttons but have a look of tortoise shell which I thought echoed the era I was inspired by. The hand openings are easily created at the side seams and the rib band is picked up after the panels are put together. You can see the colour is a lot darker on this photo, and in reality its probably somewhere imbetween the two images. A little something I have been trying to do some research on has unfortunately not got very far. A lovely lady came to see me at the Knitting and Stitching show at Alexandra Palace with a fascinating photo of some yarn that she had, with a completely unfamiliar label, both to her and to me. She asked me if I could possibly find out anymore about the yarn and where and when it was made. Below is the image of the balls and their amazing ball bands. So what do we know? Very little. It came with another similar yarn called Southdown 4ply that also features the stags head logo and is made in England. Southdown is a breed of british sheep and I am wondering if Kangaroo implies Merino (corny but the most likely reason for the name). I don't want to say any more than that so I don't lead people in any direction, but am really keen to know if anyone knows the manufacturer and the probable period of production. 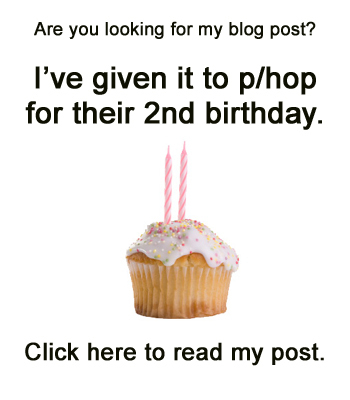 Please either comment on the blog leaving me a contact or email at the address above. I would be really grateful for any information no matter how tiny!